A squire is in trouble - he has somehow managed to misplace Sir Vyvin's sword! Can you help him find a replacement before Sir Vyvin of the Falador White Knights finds out? Speak to The Squire at the White Knight's Castle in Falador. To begin the Quest, walk or teleport to Falador and speak to the Squire. The Squire can be found wandering around the courtyard of the White Knight's Castle. After you ask how life as a Squire is, he admits to you that he lost Sir Vyvin's Sword. You suggest that you could make another, but alas, the lost sword was made by Imcando Dwarves. 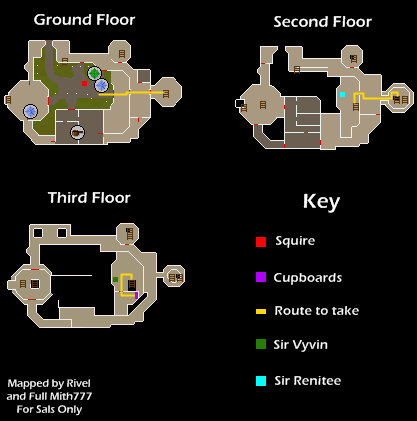 The Squire suggests that you visit Reldo, everyone's favorite librarian, who can be found in the Varrock Palace. 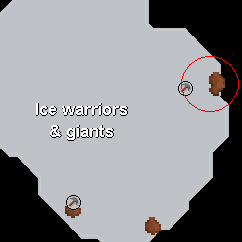 Now, walk or teleport to Varrock and go to the northernmost room on the ground floor. Speak to Reldo and ask him about Imcando Dwarves. He reveals that the entire race of Imcando Dwarves was almost destroyed by previous Barbarian attacks, and only a very small number still exist. He tells you that Mudskipper Point would be a good place to look for the dwarves. Also if you want their help, you should take a Redberry Pie, as they appear to love it. To get a Redberry Pie, you can make one yourself with a Pie Dish, Redberries, Flour and Water. Or you can just buy one from another player or the Grand Exchange. If you wish to bake the Pie yourself, you will need at least level 10 Cooking. 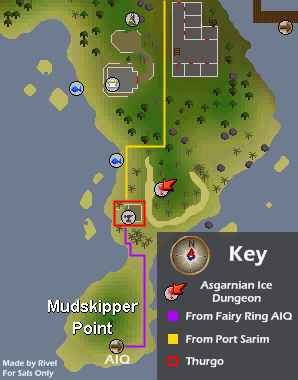 Now that you have the Pie, either walk to Mudskipper Point, or use the fairy ring code AIQ. The Imcando Dwarf, Thurgo, lives in a hut a bit north of the fairy ring. Speak to Thurgo, and ask him if he would like some Redberry Pie. 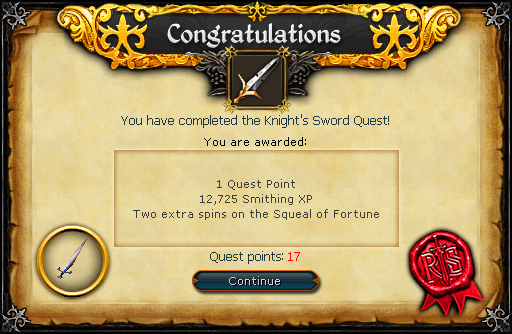 After devouring the Pie, he agrees to smith another sword. However, to make a perfect replica he'll need a picture of the original. Head back to the Squire, and ask him if he has a picture of the sword. He says that he doesn't have one himself, but Sir Vyvin keeps a picture in a cupboard upstairs. Return to Thurgo and give him the picture. He explains that he needs 2 Iron bars and 1 Blurite ore to make the sword. You can either smith the Iron bars yourself or buy them off other players. However, getting the Blurite Ore isn't so simple. Blurite Ore is untradable, and cannot be brought from the Grand Exchange. Blurite Ore can only be mined in one place. 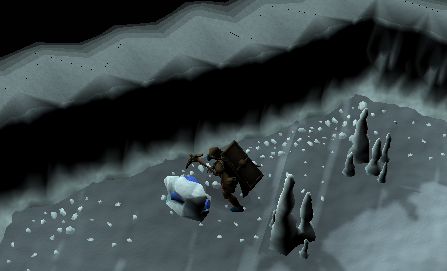 Be sure to wear armour and take food, as the Blurite rocks are surrounded by Level 78 Ice Warriors and Level 74 Ice Giants. To the east of Thurgo's hut is a small cliff. Head up the cliff and climb down into the dungeon. When you enter the dungeon, the first monsters you encounter are a group of Muggers, who are no threat at all due to their low level and their lack of aggressiveness. In the next room, there are Pirates, who could cause minor problems for very low level players. In the next corridor, there are Hobgoblins. It is advised that players with a defence level lower than 30 should run past these monsters. 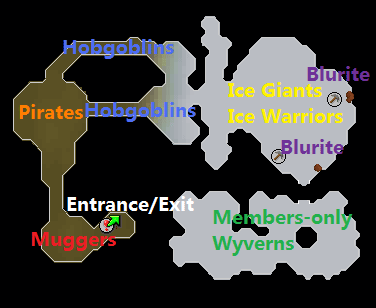 The Blurite rocks are in the ice area after the Hobgoblins. Run to the rocks, mine the blurite and run back. Tip: If you want a sword to keep for yourself, mine an extra Blurite ore and bring 4 Iron bars to Thurgo. After he has made one sword, drop it and ask him to make another. Then pick up the sword you dropped. When you exit the dungeon, return to Thurgo with the Blurite ore and 2 Iron bars, and he will smith the sword. When you have the sword, head back to the squire and... Congratulations! Quest Complete!